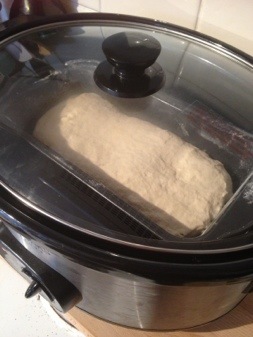 When I first heard about the slow cooker method of cooking bread I was astounded. There was no way that would work, right? No way at all… I had to try it! I am rather happy to report that it does, indeed, work! 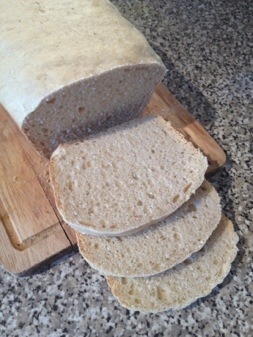 If you want a quick (slow), hands off way to get a loaf of sandwich bread on the table then this is a brilliant method! And it is quite a versatile one too. You can try it with breadbuns, flatbread, boules, anything really. Just remember to line the crock pot as otherwise it will stick to the bottom (trust me, I’ve made these mistakes so you don’t have to!) and also remember to get the bread out of the slow cooker once it has finished cooking or you will get soggy bread due to condensation. The only other issue is the anaemic look that this bread has… it’s not quite the glorious golden crust of home made bread. A grill or a blowtorch takes care of that one though! Just lightly toast the top of your loaf until you get the desired hue. This bread is the answer to my issues with crisp, crunchy homemade bread. I am all for a cracking crust. Really, I am… except when I’m not. You know, when you really just want some worthless white bread for a soft sandwich, or your wisdom teeth are playing up and crunch is BAD! 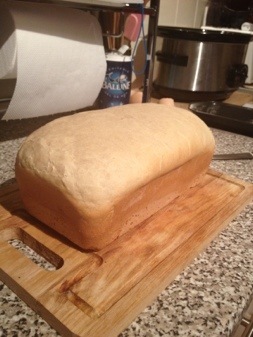 I know that supermarket loaves are filled with horrible things, but prior to this loaf I had never managed to create a delicious, soft crust in my home cooked bread. Now, I can finally get that delightfully squishy texture in the comfort of my own home! – In a large mixing bowl place the flour, then on one side the yeast and the other the salt. – Mix to combine then all and make a well in the centre. – Add the oil and the water. – Mix until it all comes together into a dough. – Knead for about 10 minutes until the dough is soft and elastic. 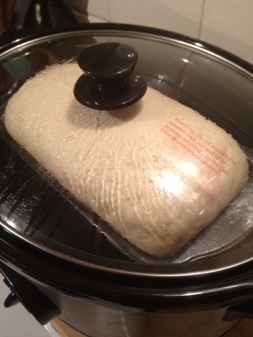 – Place the loaf in the slow cooker, pop on the lid and turn it up to high. – Bake for 2 hours. This may well vary from slow cooker to slow cooker so check and if it’s not then just give it a bit longer. When the base sounds hollow, it’s done! Everyone inevitably buys a bundt tin… or one just magically appears in your cupboards, called forth by come magical critical mass of baking tins. Either way a bundt tin appears and though there are many creative uses for it I thought I’d go back to basics with this lovely, moist orange bundt cake. So easy to whip together and so easy to devour with a cup of tea, it’s now one of my go-to cakes. Especially cute as a minature version too! If you have not yet reached that critical mass and do not yet own a bundt tin you can use this recipe to make a lovely sandwich cake, I would suggest 3 layers and a chocolate buttercream but you know, go nuts! – Heat the oven to gas mark 3 / 170C. – Grease your bundt tin well, making sure to get into any nooks and crannies. – In a large jub combine the yogurt, butter, eggs and orange zest. – In a large mixing bowl combine the flour, bicarb, salt and caster sugar. – Pour the liquid mixture into the dry mixture and mix well until combined. – When a skewer inserted into the centre comes out clean it’s done. – Remove from the oven and leave to cool for 10 minutes. – Now for the moment of truth! How thorough was your greasing? Hopefully after a loosen with a knife your bundt cake will turn out perfectly! – Leave to cool completely on a wire rack. – Once cool prepare your icing. Simply mix the icing sugar and just as much orange juice as necessary to make a thick but runny icing. – Drizzle over the top of your bundt cake artistically… or try to anyway! Add 2 tsp cinnamon and 2 tsp ginger to the mixture along with the flour and add a cup of dried cranberries in at the end. Delicious, zingy Christmasy flavours and a nice, moist, lighter cake, which is so quick to whip up it’s perfect for the busy Christmas season! Time for a little bit of a non-foodie detour! About this time last year I saw a tweet. It was about The Shotgun and Chelsea Bun Club… well, that sounded interesting, I thought! 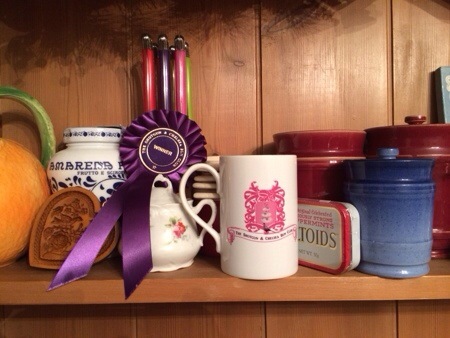 Basically, it’s a ladies only club that allows you to go along to an event, learn to shoot clay pigeons, and then have tea and cake afterwards. I’d always been vaguely intersted in learning to shoot, my parents used to shoot when I was younger but I’d never even seen a gun before, let alone picked one up and shot one! I signed myself up to go along to one in April at Coniston Shooting Grounds and I bloody loved it! It was so much fun: exhilarating, instinctive and captivating! The instructor was absolutley brilliant, explaining exactly what you needed to do and talking you through it simply. It didn’t matter that I didn’t have a clue what I was doing at first, by the time we’d been to a few different stands I really felt I was getting the hang of it all. 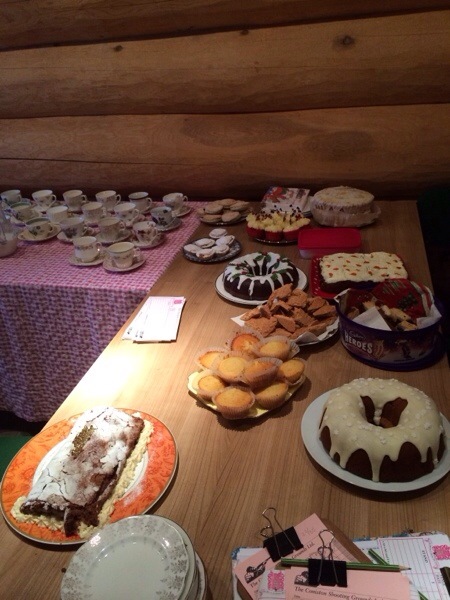 And there was tea and cake on pretty vintage china at the end of it all! Two weeks ago I went back to another Chelsea Bun Club at Conniston and, again, had an absolutley fantastic time. It was just as much fun as I remembered and given it was only my second go I was absolutley gobsmacked when I won the best novice prize! It’s definitely something I’m going to keep doing, I’m waiting on tenterhooks for next year’s dates so I can see how many events I can fit in and am even looking into getting some private lessons. It’s not often I take to something so readily and have the skills to back up my enjoyment but I’m really looking forward to developing my ‘beginner’s luck’ into some solid skills. If any of you ladies have ever fancied having a go at shooting I cannot reccommend the Chelsea Bun Club highly enough. It’s such a friendly, welcoming group. No matter if you’ve been shooting for years or never even touched a gun you’ll fit right in. It’s lovely to meet new people and chat about random things while doing something so totally different from my day to day! 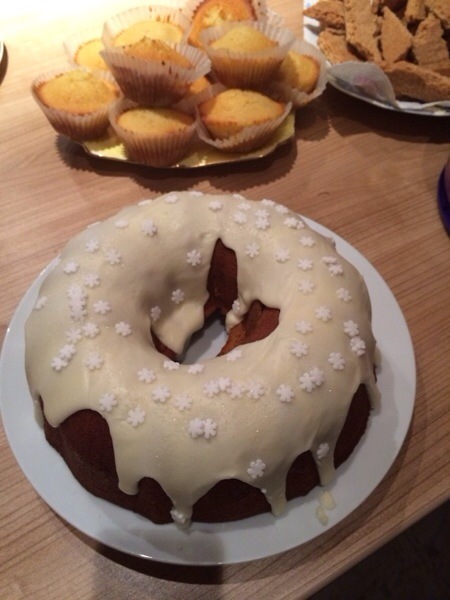 Now, as my token, “It’s relevant to the blog, honest!” have a recipe for my Orange Bundt Cake that I took along to the last event! So… this has been a rather long and unplanned hiatus. I want to apologise to anyone who has missed my random ramblings. This year has been a strange one and has been rather challenging in a lot of ways. Life has been throwing me some curve balls and there have been a lot of ups and downs. However, I’m back, I’m healthy, I’m happy and I am determined that 2014 is going to be a brilliant year and that I will not allow this blog to suffer any longer. I love blogging, I love sharing all of my foodie thoughts and experiments with you guys. I love receiving comments from people who have tried things and being able to offer and receive advice. In order to motivate myself I have even gone and got myself a domain name, just to pretty things up! If you want to add http://www.annainthekitchen.co.uk to your bookmarks and check back with me in the year to come then I promise not to go AWOL again and to keep the recipes coming! An excellent Christmas breakfast, my Christmas Tree Chelsea Buns are full of christmas flavours! Anna’s Breakfast Bites are an essential part of our Christmas. If you prefer something savoury, or just need some brunch to keep the munchies at bay while waiting on the turkey, these are a fantastic crowd pleaser! If you are in need of a very quick recipe to whip up and take into the office may I suggest my Christmas Muffins. Cranberry Fool, a brilliant way to finish a Christmas meal if the traditional Christmas Pudding just isn’t for you! And finally, Fudge! That perennial favourite for home made gifts. You can make this in so many different flavours, it’s perfect for that personal touch, and so much easier than you think it will be!